Tri-Country boarded their planes and are currently enjoying a view of the Caribbean or Mexico from up above. Their feelings are mixed. While they are happy to see family and friends again (and to eat some food outside of rice, beans and chicken), they know they are going to miss the rainforest and the lifestyle it brought them. Regardless, they had an incredible 85 days here. "I am so happy to have come here... it's all I could've hoped for, and I wouldn't change it for anything." Some of their take-aways from the experience? Appreciation for simple lifestyles. Ability and excitement to cook. Motivation to take on more responsibility. Appreciation for the outdoors. Being a better leader. SCUBA certifications. Happiness. El Rio General, where the Leadership and Multi-Element students are rafting for four days in Class III-IV rapids until Sunday, is located in one of the most biodiverse areas in the world called South Puntarenas. From rare species of birds to endangered animals, a plethora of wildlife can be seen in this part of Costa Rica, which cannot be found anywhere else in Costa Rica. Much of the flora and fauna in Costa Rica are indigenous. Rugged and isolated, South Puntarenas is an adventure lover’s haven. The terrain is wild and in many parts unexplored, giving a feeling of mystery and seclusion (especially since this area is not easily accessible by road). But this is perfect for us at CRROBS because these are the adventures to which we are addicted, right? This part of Costa Rica is home to the breathtaking Parque Nacional Corcovado along with many beautiful remote beaches and superb wildlife. Read more about the 43-mile Rio General by clicking here. Base is active today! Two of our courses, Leadership and Tri-Country, are staying the night at our base dorms. They're pretty tired, and will probably go to bed early after eating some rice and beans for dinner in la cocina. Every student in Leadership passed their WFR certification! In a celebratory spirit, they left base for the first time in 8 days today to hike to a waterfall near base here in San Ramon de Tres Rios. Students loved this waterfall for rappelling - it was much more intense, big and fun than the one they did in Piedras Blancas. They leave Thursday for some rafting. Tri-Country students have lighter hair and much darker skin after many days in the sun in Manuel Antonio and Jaco. They're not stopping there with the surfing. Because of their speedy progress with the sport, the group will head out tomorrow to Playa Avellana for better surf and more practice. (View these three beach destinations above, marked by pink squares.) This is their final trip on their 85-day journey through Costa Rica and Panama. After walking through base yesterday and seeing a simulated accident (complete with blood, screaming, and running), I knew the Leadership course was almost finished with their WFR certification classes. They all passed their written tests this morning, and they have the final test this afternoon: the practical. They are in teams of two, and they are given 3 different crisis scenarios to handle. But once this is all over, they can leave the "classroom" and head to the waterfall tomorrow for some rappelling! Canyon School arrived back in the States today, and they had a fun and memorable time. To quote one student: "We (Americans) have so much stuff that we take for granted. But I realized, when I got to the homestays, that life can even be better with less technology and living life to the fullest. Pura vida!" 33 days until our high season. In the field, Tri-Country is on their fifth day of their surf course in Playa Tulin, which is good timing because the rangers at Tulin have a lot of projects they could use help on. They wil be at Tulin until the 14th and will finish out their surf course at Manuel Antonio for seven days. Canyon School flew in Saturday night and were shuttled to Las Rejas Sunday morning. They arrived at their first homestay at the Lopez house a little after noon on Monday. Leadership is down in the cocina for day 4 of their WFR course with Phil Perez. They will be doing the WFR until the 19th. What is a WFR, you ask? The WFR, Wilderness First Responder, is a certification combining the Emergency Response Certification with additional hours of curriculum and practice for application in the wilderness setting. The ERC (a 48-hour DOT course certification) is required for police, athletic trainers and firemen in the USA, and it is administered by the American Red Cross (ARC). Due to the remote nature of our courses our lead field staff are required to have successfully completed the WFR course. Certification from ARC and CRROBS is valid for 3 years. Apart from an abundance of oxygen, what do the redwood forests of California and the rainforests of Costa Rica have in common? This week, a group of five 8th graders from The Canyon School in California and their principal, Chris Kerrigan will have the opportunity to find out for themselves as they compare the rich and unique ecosystems of Costa Rica with that of their home town in Northern California. Canyon is an exemplary school that takes a unique approach to education, providing an intimate learning environment for kindergartners to 8th graders and fostering a diverse classroom environment. Students are divided into three classrooms, one for K-2, one for 3-5 and one for 6-8, allowing them to help and learn from one another. 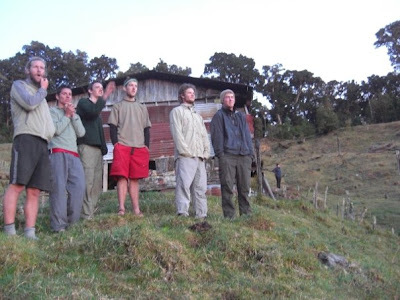 During their time in Costa Rica this group of students will be led by Costa Rican Instructor Santiago Lopez and Foreign National Instructor Rob Wyrwicki on an 8-day multi-element expedition, including trekking, homestays, surfing, rafting and zip-lining. They will return home with a broader understanding of the world and a greater appreciation for the environment. This week two of our courses, Leadership and Tri-Country, are in Panama getting SCUBA certified by our very own Executive Director, Jim Rowe, PhD. So what does it take to get SCUBA certified, you might ask (especially if you're a parent, wondering what your child must go through in order to get such a gold stamp)? 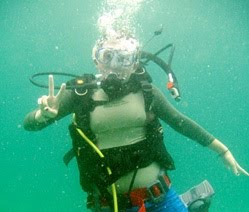 First of all, all of our students' certifications are backed by NAUI (National Association of Underwater Instructors) Worldwide, the world's most respected, largest non-profit diver training organization in the world. It was established in 1959 as a membership association and organized solely to support and promote Dive Safety Through Education. * Contained Dive: This usually happens in a pool or very shallow water to practice standard rhythmic breathing and buddy breathing. * Open Dive #1: Students descend in water approximately 10-20 feet for 45+ minutes or more, always with an instructor. They must apply a few practical emergency skills, such as mask clear and retrieval of regulator. Hand signals are also practiced. * Open Dive #2: Students again descend in water with their instructor about 10-20 feet for 45+ minutes. Practical challenges consist of Dive #1 tests in addition to a few more. * Open Dive #3: Students descend for another 45+ minutes with their instructor, this time about 20-30 feet. Practical challenges include those of Dive #1 and #2, and the instructor will add a few more, such as equipment removal and reapplication. * Open Dive #4: This is the final 45-minute dive with their instructor, and students must quickly be able complete all practical challenges as well as troubleshoot fake emergency situations. * Free Dive: Students are allowed to explore always within sight of instructor. And lastly, SCUBA - for your trivia lesson of the day - means Self-Contained Underwater Breathing Apparatus. Two of our current courses are in Panama together this week, becoming SCUBA professionals. Leadership left this morning after an educational weekend at a pool getting their Lifeguard certification from the Asociación Costarricense de Guardavidas (Costa Rican Life Saving Association). Leadership has one more month to go! Well done, estudiantes. 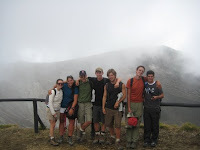 Tri-Country left yesterday from base, after an exciting day busing/hiking up Volcan Turrialba on Saturday. 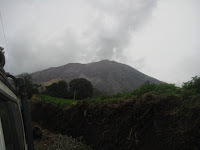 After picking out some fresh fruit at our local Feria (our weekly farmers' market), they were bused two hours outside of San Jose to see the active volcano in Turrialba. Because of gases releasing from this active volcano, officials force visitors to depart after only 20 minutes of taking pictures and staring in amazement into the crater. 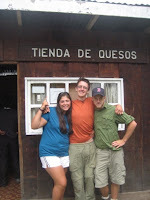 On the way home, the group stopped at a local queso (cheese) shop - an important stop since the Turrialba area known for its fresh cheese. 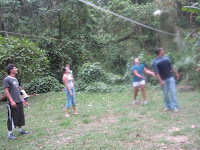 They worked it off in the afternoon with a vigorous game of volleyball at base. Tri-Country students will leave tomorrow to hike Volcan Turrialba (an area known for its incredible tico cheese) which is about two hours outside of San Jose in the Cartago province. Leadership students are celebrating the completion of their Technical Ropes & Rescue Operations (TRRO) certification. They are getting geared up for more leadership education as they head into Lifeguard Training this weekend in San Jose or Tres Rios.